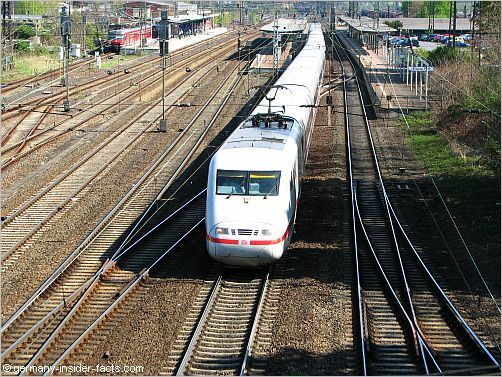 The German rail network connects the major cities in Germany with high-speed ICE trains. Additionally, regional express & other local trains let you travel to nearly every German town by train. Especially for long distance travel between the major cities in Germany, the high-speed ICE trains have their advantage over domestic flights, or driving for hours on the Autobahn. Relax in a comfortable seat and enjoy the lovely German countryside passing by. Do you know a better way to travel large distances in a beautiful country? The German rail service has a high reputation. Trains are usually in time, they are fairly clean and efficient. I love to travel by train, especially with the convenient ICE trains. The ICE - InterCityExpress train is the "king" among German trains, fast and convenient. However, tickets for this comfort cost slightly more than on other trains. IC - Intercity trains run between major cities at frequent intervalls. EC - Eurocity trains connect with cities in neighbouring European countries. RE - RegionalExpress trains connect smaller cities with the big smoke. These trains are often used by commuters, so avoid to travel in the rush hour, especially with lots of baggage. When you travel on a tight budget, you can use regional express trains to travel all over Germany. You just have to change trains every so often. RB - RegionalBahn stops at every train station and connects the rural areas with city centres. S-Bahn trains criss-cross the major regional centres at frequent intervalls. With the S-Bahn it is easy to get from the airport to the city centre or the main train station (Hauptbahnhof) in the big cities. U-Bahn and bus services are not operated by the Deutsche Bahn. They are usually run by companies either owned by local government or private operators. They can really bring you to the doorstep in cities. DB Autozug - Want to explore France, Italy or Austria with your own car but don't like the long drive? Take the car with you on the train, travel by motorail! DB Autozug terminals are in Berlin, Düsseldorf, Hamburg, Hildesheim, Lörrach, Munich and Neu-Isenburg (near Frankfurt). You can even use the DB Autozug for convenient travel within Germany, for example from Hamburg or Berlin to Munich or vice versa. The range of train tickets, German rail passes, and rail passes that include other European countries is overwhelming. To add to the choice, you can buy train tickets and passes for first or second class travel. Train travel in Germany is considered a bit pricey, especially compared with trains in southern Europe. On the other hand, German rail (Deutsche Bahn - DB) has a good reputation. Although delays happen occasionally, you'll usually arrive at your destination in comfort and time. You can really save money if you plan your trip ahead, and purchase a Sparpreis point-to-point ticket in time. To be honest, Deutsche Bahn standard fares are not a bargain, although they give you the independence to hop on a train whenever you want. You can reduce the cost for standard fares by 25% or 50% if you have a Bahncard or if you book in advance and get the mentioned Sparpreis / Saver Fare. Sparpreis tickets are only available for return journeys from and to the same train station, and for a certain day and time. You must book at least three days in advance, and tickets are subject to availability. The ticket is only valid on the train you have booked. Don't want to nail your itinerary down before you go? A rail pass gives you much more flexibility. You decide how many travel days you need, and validate them in your pass on the day of travel. When you stay longer in Germany, it is even worth to consider buying a Bahncard.